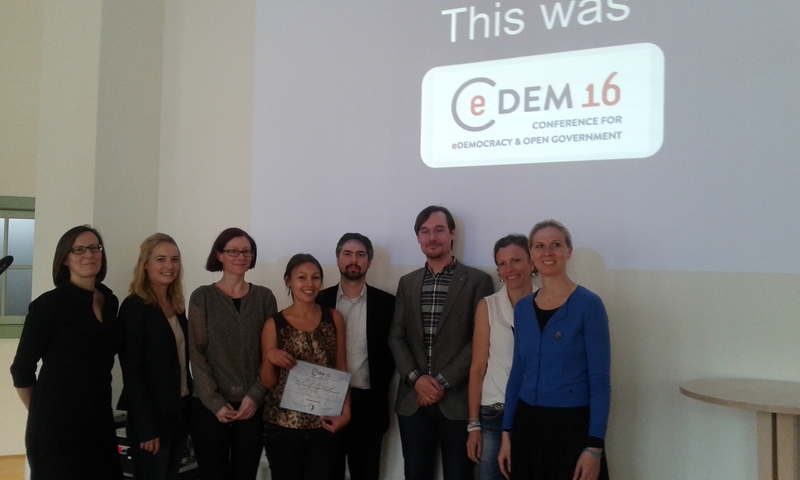 Gerlinde presented the CeDEM16 Best Paper Prize to Rebecca Rumbul (mySopciety, UK) for her paper ” Tools for transparency? Institutional barriers to effective civic technology in Latin America”. Mila Gascó (Institute of Public Governance and Management ESADE) held her keynote “Co-Production and ICT-enabled Co-Production” at the CeDEM16. Mila Gascó holds a MBA and a Ph. D. in public policy evaluation (Award Enric Prat de la Riba granted to the best Ph. D. thesis on public management and administration, given by the Escola d’Administració Pública de Catalunya in Barcelona, Spain). Nowadays, she is a senior researcher at the Institute of Innovation and Knowledge Management and the Institute of Public Governance and Management, both at ESADE. In the latter, she is in charge of the e-governance, open government and smart cities areas of research. For seven years, she was a senior analyst at the International Institute on Governance of Catalonia. Mila Gascó has a lot of consulting experience on the information and knowledge society as well. Open government can be defined as a transparent, collaborative and participative government, that mixes different ICT-tools in order to reach its objectives. Collaboration refers to the work of the public administration (internally and externally), which can be distinguished from participation. Social innovation is usually bottom-up led, while co-production is usually top-bottom-led. Co-production encompasses stakeholders and citizens in further developing public services (precise definition see OECD, 2011). Co-production can be shaped in co-commission over co-design, co-delivery and co-assessment. Co-production is linked to open innovation: Based on Chesbrough, the open-innovation concept has been applied on the private sector. Approaches to apply this concept on the public sector were needed. Open Innovation means searching for solutions outside of organisational boundaries (Mergel and Desouza). We used to co-produce before, but ICT makes it different nowadays and links it to open innovation. What has changed is the citizen-centricity. Public services can be made more efficient, but they will only be more effective if citizens’ opinions are taken into account. As example of using open data, developing apps and engaging people, inter alia rodalia.info (Spain) can be mentioned. Rodalia asks citizens and organisations to help identifying potential terroristic actions or related suspenses. Public administration can’t monitor everything, therefore, they co-produce. Co-production can be seen in the actual building of an app (using open data to build the app) or also in using citizen feeds in order to make the app very useful. We have always co-produced. Otherwise it would be impossible to deliver some services: A co-produced service is f.i. taking out garbage to make the collection and removal of garbage possible. Organizational factors: A risk averse administration culture, the preparedness for participation (hierarchy? bureaucracy?) and an open attitude (The leadership decides to co-produce, but who really co-produces? The persons who undertake the role of co-producers shall have an open attitude too.) play a crucial role for co-production. Citizens’ behaviour: People need to feel heard and want to improve things, which is why it should be made transparent, what contribution was helpful for what step or how their contribution was taken into account. Not everyone wants or knows how to co-produce. Co-production is not for free, it involves especially the resources of time and money. Often, the process is much more important than the outcome itself. After a co-production process, we will come up with more empowered people. Co-production does not need ICT, but the latter will speed up the co-production process. ICT-enabled co-production is contextual, over all in organisation and design. Efthimios Tambouris held his keynote “Multidimensional Open Government Data” at the CeDEM16. Efthimios Tambouris is an Associate Professor of “Information Systems and eGovernment” at the Department of Applied Informatics at the University of Macedonia, Thessaloniki, Greece. Before that, he served at Research Centers CERTH/ITI and NCSR ‘Demokritos’ and the ICT Industry. Dr. Tambouris holds a Diploma in Electrical Engineering from the National Technical University of Athens (NTUA), Greece, and an MSc and PhD from Brunel University, UK. During the last sixteen years he has initiated, coordinated and participated in numerous EU-funded research projects mainly in the field of eGovernment. He is an expert for the European Commission and CEN. He is co-chair of the IFIP International Conference on eParticipation (ePart) and has more than 150 scientific publications. There are various open data portals and a lot of conceptual research has been conducted. When examining data portals, it becomes apparent, that the vast majority of the data are numbers (demographic, statistical data etc.). Statistical analyses, visualisations and the development of apps are possible. What’s new in the OGD portals environment? New is the fact, that one has access to so much data. Searching for international data might though be not too easy, because this would have to be done using different data portals. Looking at internet usage vs. individuals’ level of internet skills reveals certain correlations. To take one example, data.gov.uk was selected with the objective to get data on unemployment. This showed, finding the data even on only one data portal can be quite difficult, as the result were over 1000 excel files, which would have to be all opened manually. Data being located in excel or csv files and being distributed makes reaching good results challenging. Usually, being provided only with a number doesn’t suffice to understand its meaning, as it is dependent on the context as f.i. what is measured and to what place the measurement – which is expressed through the number – refers. Statistical data can be compared to data cubes encompassing different dimensions. To stick to the example, such a dimension could be the age of a person if we deal with the issue of unemployment. Data can be rolled up or drilled down (in the sense of summarizing and climbing up a hierarchy or reducing a dimension on the one hand or going down a hierarchy), diced and also sliced, as is shown visually. One challenge is the knowledge necessary for expanding cubes with data of different cubes. These different cubes could encompass the same dimensions, but comprise different measures. The research project Open Cube deals with the question of how publishers can publish their content in cubes and how users can make use of it. Through the internet, within one’s working environment a SPARQL query can be issued and an answer is transferred, provided that the data is stored in the RDF-format. This can also be applied with different sources, which would solve the problem of linking open data portals. With reference to Tim Berners Lee’s 5-star model, a portal publishing data in RDF should be assigned with four stars, while providing Linked Open Data is seen as 5-star-procedure. The RDF Data Cube Vocabulary allows to model multi-dimensional data as RDF-graphs. There is a need for tools in order to start with your own data if you want to create statistical cubes and there are lots of tools, starting from XLS and CSV. New is the expander, which was added to the cube structure and the data (table view). A compatibility-check is done by the software and makes suggestions to supplement the data with f.i. newer data on the same issue. The tool supports different visualisation techniques and enables f.i. comparisons of data of the same topic from different regions (as f.i. employment data). In the afternoon of CeDEM16, three workshops took place, of which I participated in the Virtual Research Environments one. The workshop dealt with virtual research environments and issues of data sharing in such environments. Virtual research environments (VRE) and related theories are already used in different projects, e.g. ENVRI bringing together research environments in the domain of environmental science, or ELIXIR, a distributed infrastructure for life-science information. Those do not allow for interdisciplinary research. Researchers often want to conduct multidisciplinary research with open research data often face a number of problems in existing research environments: data context (how is data usually collected in another domain), data heterogeneity, user experiences, or fast changes to datasets. The workshop was for potential users of open data research environments. The VREa4EIC project is developing a reference architecture. It aims at f.i. increasing the usability of VRE, to increase the quality of user experiences and to improve contextual awareness and interoperability. What is wanted is a kind of information pool. Privacy by Design-related issues are that often data is collected from individuals, and privacy is a complex construct interpreted differently among countries and cultures. Big data is always a threat to privacy. Also: was consent given to share information? Who owns the data? Do you have the tools to anonymize? How does anonymization work? Can it never be traced back? A challenge of the researcher sharing data is also trust in users: Do you think the user can interpret the data in the right way and has the skills and capabilities for handling the data. The workshop part discussed requirements of VREs and possible scenarios based on open data, e.g. mass migration in Europe, the oganization of a music festival in Vienna, or studying the effects of pollution on cancer.